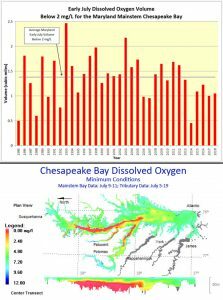 Dissolved oxygen conditions in Maryland’s portion of the Chesapeake Bay mainstem improved in early July, according to the Maryland Department of Natural Resources. The department tracks hypoxia throughout the summer during twice monthly monitoring cruises. The hypoxic water volume (areas with less than 2 mg/l oxygen) was 1.05 cubic miles, nearly 0.6 cubic miles less than in late June, and 0.33 cubic miles less than the early July average. No additional hypoxic volume was observed in Virginia’s portion of Chesapeake Bay, and no anoxic zones (areas with less than 0.2 mg/l oxygen) were detected in the mainstem. Hypoxic conditions were worst off the southern tip of Kent Island, occurring at around 6 meters below the surface to the bottom. Lower Maryland stations saw hypoxia begin at 11 meters or deeper. 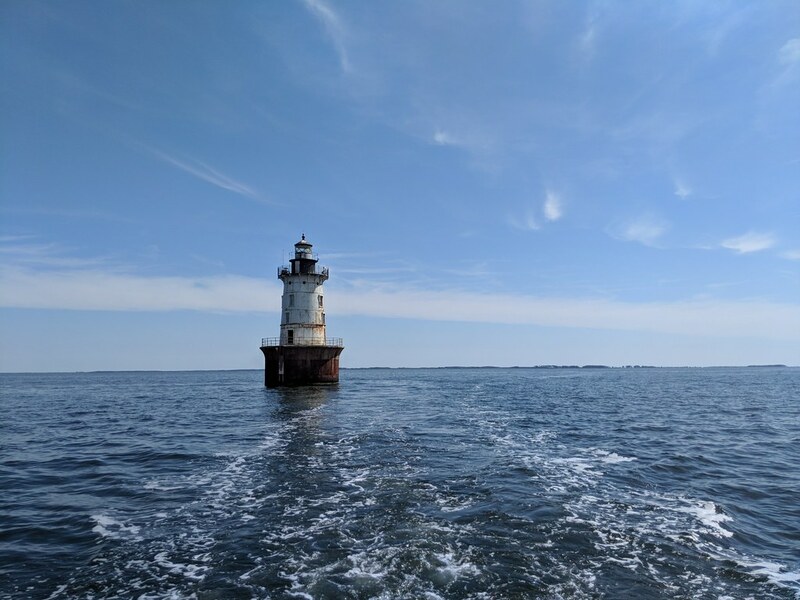 Hypoxia was generally more concentrated toward the bay’s deeper center channel, unlike in late June, which partially accounts for the improvement. Monitoring crews are currently gathering results for the late July report. 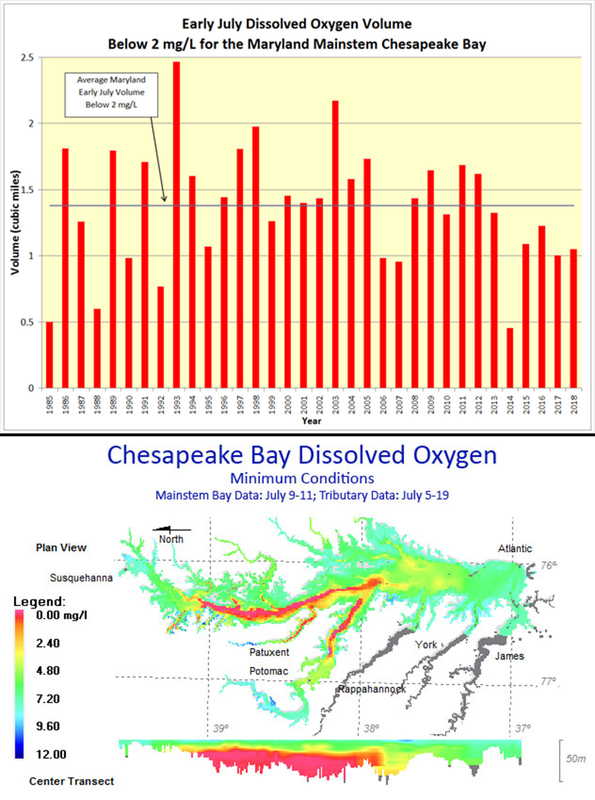 Historic rainfall observed July 21-25 throughout Maryland and Pennsylvania is expected to inject large amounts of freshwater and associated nutrients and sediments into Chesapeake Bay, possibly affecting hypoxia results well into August. In the beginning of June, National Oceanic and Atmospheric Administration, U.S. Geological Survey, University of Maryland Center for Environmental Science and University of Michigan scientists predicted a slightly larger than average hypoxic volume for the bay due to higher spring flows and nitrogen loading from the Susquehanna and Potomac rivers. Crabs, fish and oysters in Chesapeake Bay require oxygen to survive. Scientists and natural resource managers study the volume and duration of bay hypoxia to determine possible impacts to bay life. Each year (June-September), the Maryland Department of Natural Resources computes these volumes from data collected by Maryland and Virginia monitoring teams. The Virginia mainstem is monitored by Old Dominion University under contract to Virginia Department of Environmental Quality. Data collection is funded by these states and the Environmental Protection Agency’s Chesapeake Bay Program.